It is not really diptych (not the result of hinged oppositions) when a conductor conducts in two-two time. The baton swings back and forth but not between two of anything: instead it swivels in an ongoing overlap. For this reason the back and forth of a baton (when in two-two) is more like conducting the candors of a smear. Please excuse (enjoy) an inherent back and forth shape as you move through my engagement with this marvelously pleasure-filled book. 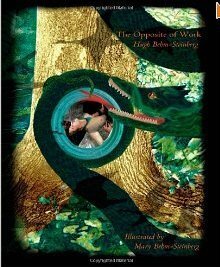 A child (“beautiful[ly] unbearable body”) emerges from the curled spinal column of an ancient reptile which itself is protruding from the green of an old growth tree. Is green always mythological? A compendium of chlorophyll-like ducts keeps us in myth. “What was unknown/ becomes patterned” as the pages flip. An egg emerges and there is a face to be sought (if not seen) (“until you were named/ you filled up space”) in the egg. There is a nest that is being intuited. The child is an initially unclear (“and I get to feel my body/ stop being my body”) stanchion: though lavish, not transparent or simple. Yet, the reptilian spotted egg is becoming clear (“white roots, eating silk”). “The Opposite of Work” is relation, comparison, juxtaposition as manner of thrive. Does the child have scales for legs? Are the scaly legs of a phantom child a parallel to a forthcoming nest? A nest and an egg (“merge apples”) are being lifted onto a growing water: a water that is blotting out the stairs. More flips and the noir deepens. Notice the smeared ball in the disappearing child’s hands. Are we in the dark under of an inner? Is it with the addition of the growing water that we have become the phloem and xylem of this tree: a place where a feral child’s (“one day I’m going to grow/ an impossible beard,/ a gentle but/ hardworking/ beard”) memory (“memory,/ which is naming”) can run free? There are contents (“I’m looking for/ where to put/ heaven so it’s/ more in reach and/ easier”) within the foamy egg. I can feel them. A child’s holding is in a tree’s middle and within that tree’s middle a secondary egg floats. Is the egg crowned (“as not/self/ or a cornet”)? Is it crowning (“to let the rust out”) as it contorts to turn itself into some version of a consort? To birth a bra-less woman into image means indelibly looking upward (“how are you going/ to make yourself/ vulnerable/ when for much of your life/ you’ve been/ so fierce?”). When a bra-less women is fully revealed as an image of pleasure, the second set of hands (“a/ full grown man/ with milk on my lips,/ which is good”) are finally able to be seen within the scene. Is this second set of hands tying ribbons around the soft body (“Stretching out your rain:/” or “Steam in the house,/ your children bathing/ their children,/ your wife saying,/ how should I/ describe this?”)? The woman who is being caressed suddenly disappears completely from the center of the egg (which now appears to be translucent but covering what within it (Tell me if/ the mouth is a cave” or “a sink you/ can drink from”)) is keeping it from being hollow. The following comes howling from an egg: “And you’re/ the sound,” as we move along because this “love is/ an embodiment of/ place.” We are staring at the bare breasted woman again but she is reaching beyond the limits of the egg toward the materialized boy who is handing her the egg in the nest (“I keep/ a smaller house/ in my pocket”) in his hands. Is this how and when an egg enters another egg to engender it (“against/ God or a/ stone everything is/ delicate” or “you see a tooth and it’s like when/ you see one/ thing and then/ you see everything”)? The bare breasted angel, whose wings are now revealed reaches out, grabs the nest while also grabbing the boy. When that touch occurs the boy’s lower body becomes that of an extra-dark blackbird (“or your/ hand is/ half a/ wing, a/ scissor” or “all the/ animals talk and we know/ what they’re saying”). The nest’s previous, central egg suddenly appears there at the level of his perineum, his primary chakra. When they kiss so gently that it could almost be read as platonic, I wonder if these two are lovers (“what to do with your body/ which in turn has no idea/ what to do with you,/ which allows you/ to make love more easily,” or “ transposing that there/ with all those/ other there’s,/ the lifting parts/ especially”) or child and mother (“so that when you/ curl up against me/ I feel like half a set/ of apostrophe marks/ around some magnificent quotation”)? When the two touch, eggs and flames gather in their enjoined body. Is this what DNA looks like in the heart of a third-eye (where images (“a part that/ shows another part”) are core articulations)? The longer the boy stays kissing this exposed woman the more she turns from human form to dark wing to ducts of light (“circle of volition”)? Is he electrocuting her with his image, his insistence as counterpart (“we can sneak in, we can/ become elliptical and/ not resent anymore”) to her in image? With slicked back hair and bare breasts that stare, are forms the daring coins discovered in the fossil of animals (“language with/ wolf tones”)? In morphology, a figure is capable of becoming compatible with another figure. They can share the upward ebb and they do so just as a foaming reptile reappears. When the tenuous lapping of the reptilian tongue puts pressure on them the two figures (which are now (again) crows) fly, shot into the air by the sprigs of their aphotic spring. At the bottom of all organs, is a rabidly moving image finally able to rest? Look at the egg-heart as you ponder (“eat[ing] ice to stay warm”). The anatomy of a break in bleakness, but the anatomy of indelible and ongoing merge presents itself as a series of endings (non-endings). A bare breasted ghost leaks dependent-perineum at the base of the original tree.